I don’t make masala vadai that often but when i do i make few extras to make masala vadai kulambu for lunch.You can either steam the vadai or deep fry them before making the kulambu.Click here for masala vadai recipe before starting with masala vadai kulambu recipe. Heat oil in a pan.Add the green chillies and curry leaves.Now add the onions and cook until they turn transparent. Add the chopped tomatoes and cook until they become soft and mushy. Add the coconut milk,turmeric powder,chilli powder,salt, and bring to boil. When it boils simmer to low flame and cook for 10-15 mins. Add the masala vadai and cook for 2 more mins on low flame.Switch off the flame. When the oil separates,Masala vadai kulambu is ready to serve.Serve with Steamed rice or Idly. A nice and very different recipe, Swapna. I look forward to to trying this sometime. Awesome recipe…im gonna try it…. 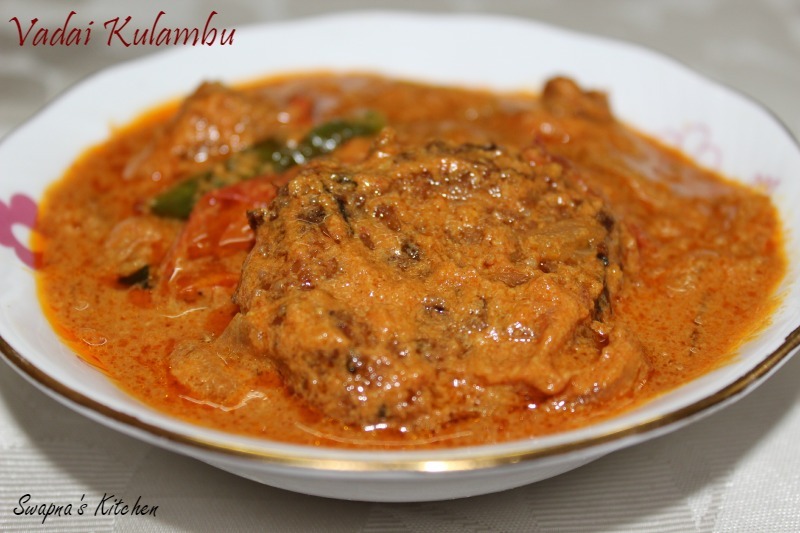 Superb recipe….everybody will love it i think….